Tour de France Lanterne Rouge: Need a new bike? How about a slightly used Trek Madone for your next road bike, starting at $8,200? 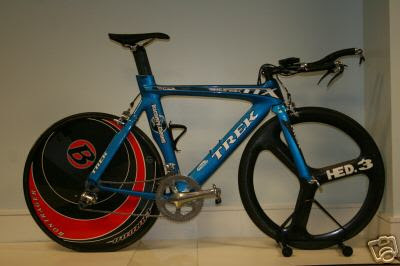 Or perhaps a Trek Equinox time trial bike starting at $10,200? I'm pretty sure you can get those old Discovery Channel decals off with a heat gun. . . .
Update: They got NO bids at all on the bikes. But some of the used helmets were bid up over $800! I would need to get a heck of a lot faster to feel worthy enough to be seen riding one of these bikes. Ha! You can put it on display in the garage until then, right? ?